San Diego’s Balboa Park offers a window on a revolution in American geographical and maritime thinking. Pity me. The International Studies Association annual convention met in San Diego last week, and duty demanded that I represent our College there. I co-presented an article critiquing scholars’ idea that “offshore balancing” should form the hub of U.S. grand strategy. That’s a story for another day. 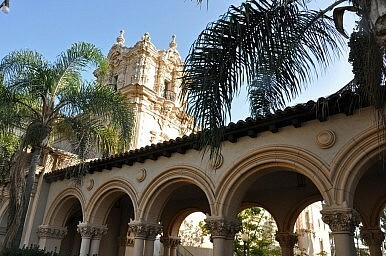 While in San Diego I stole away to Balboa Park for a few hours. It was my first visit to the park since 1984, when Midshipman Holmes rendezvoused with aircraft carrier USS Carl Vinson (CVN-70) at North Island Naval Air Station for a Pacific deployment. The place is as beguiling as I remember from those thrilling days of yesteryear. For me, three things stand out about Balboa Park: its setting, its history, and what that history says about the American geographical perspective. First, the setting. The architects’ buoyant mix of Spanish Baroque, Mission Revival, and Indian architecture, with the occasional Islamic accent thrown in for good measure, remains as fresh as it was when the park constituted the centerpiece of the 1915 Panama-California Exposition. The exhibition took its name from Vasco Nunez de Balboa, the first European to sight the Pacific Ocean from North American shores. Balboa claimed the ocean for the king of Spain. The park, fittingly, takes its maritime character from the Spanish adventurer. Nautical themes abound. The exposition marked the opening of the Panama Canal after decades of off-again, on-again construction efforts. Starting around midcentury, French, British, and ultimately American engineers had a go at digging a canal across Nicaragua or Panama. The new waterway finally admitted its first interoceanic ship in August 1914. The Panama-California Exposition was San Diego’s way of advertising itself as the southernmost U.S. port of call for coastwise shipping passing hither and yon along the West Coast. The city’s predominantly southern gaze explains why the exhibition’s designers chose to depart from the neoclassical architecture then in vogue for world’s fairs and expositions. It set San Diego apart from San Francisco, at the time California’s most populous and influential city, which – then as now – tended to face more toward Asia than Latin America. Which leads to the second noteworthy thing: the park’s history. A private initiative, Balboa Park was the brainchild of San Diego Chamber of Commerce president G. Aubrey Davidson. But the project swiftly got entangled with intersectional, California, and Progressive Era politics. New Orleans, the nautical gateway to the North American heartland, clamored to hold the flagship exposition. San Francisco organized one of its own with congressional support – and remonstrated with San Diego city fathers to cancel theirs. To which this small town’s (population circa 39,000) electorate responded by voting taxpayer money to fund the project. Both cities sought outside help. Congressional and presidential politics intervened in 1911. Congress had already approved San Francisco’s Panama Pacific International Exposition. Soon afterward the U.S. House approved a resolution appealing to President William Howard Taft to invite Latin American countries to build exhibits at the San Diego fair as well. Eminent San Franciscans then implored Taft to reject the resolution. In exchange, they promised to back the president’s reelection bid the coming year. A Senate committee scotched the House measure in early 1912. After this rebuff, San Diego Republicans shifted their election-year support, helping elect Democrat William Kettner to represent the city in the House. Meanwhile, California Progressives and Republicans united behind Theodore Roosevelt’s bid to return to the White House. Taft ended up narrowly losing the state en route to a third-place finish against Roosevelt and victor Woodrow Wilson. Representative Kettner pushed through a bill authorizing foreign exhibits at Balboa Park. President Wilson signed it into law in 1913. Such were the intrigues leading to the Panama-California Exposition. And third, the park furnishes a reminder of the almost Copernican revolution in American geographical thinking at the turn from the 19th to the 20th century. Digging a canal meant artificially – and substantially – modifying the New World’s geography, and in the process bringing an entirely new, interoceanic sea lane into being. The prospect of easy east-west movement between the Atlantic and Pacific oceans reshaped how Americans looked at the world. Their republic mainly faced eastward during its founding age, gazing along the Atlantic sea-lanes toward European motherlands. As the United States spread westward in the 19th century, conquering a continent and its Pacific coast, the American worldview took on a second, westward axis. Asia was implanted in the popular and elite mind. Both the Asian and European vectors, however, pointed out horizontally from North American shores. The opening of the isthmian canal added a vertical, north-south vector. In 1898, the Pacific-based battleship USS Oregon was forced to circumnavigate South America to get into the Caribbean fight against Spain. No more. No longer did men-of-war and merchantmen have to round Cape Horn to travel between the two oceans. They could shorten their voyages, saving time, money, and hardships. The U.S. Navy could “swing” between theaters, concentrating power where needed the most. As a result, the American worldview now arced from New England into the Caribbean Sea, across Central America, into the Pacific – and thence northerly along the West Coast or westerly toward Hawaii and the colonial holdings wrested from Spain. In particular, the imperative to defend the Philippine Islands, annexed following the Spanish-American War, beckoned attention first south, then far, far to the west. Nearly a century hence, residents of the Americas have long taken east-west movement between Atlantic and Pacific for granted. But as it happens, the Panama Canal is back in the news. The facility is undergoing renovation and expansion to accommodate larger merchant ships carrying bigger cargoes. The project has fanned speculation that Houston will be the beneficiary of new shipping patterns. The idea is that vessels will put in along the Gulf Coast, then ship their goods overland by rail or truck rather than continue around Florida to East Coast seaports. One wonders whether Houston will try to nudge events along the way San Diego once did. Will we witness a Panama-Texas Exposition reminiscent of San Diego’s grand event – and, if so, will such an event match its forerunner for grace and panache? James Holmes is an associate professor of strategy at the U.S. Naval War College and author of Theodore Roosevelt and World Order(2007).The views voiced here are his alone. For the second time in three months the three countries are holding an anti-submarine warfare exercise in Asian waters.